When it comes to saving energy and money, nothing does better than insulation. This is your number one defense against energy loss and soaring energy bills. Although all insulation is eco-friendly to some extent, there are some types of insulation that are more so than others. One of the most eco-friendly types of insulation you can get is spray foam. This type of insulation is usually made from soy, which makes it organic. The biggest advantage that spray foam has over traditional insulation is that it can seal up even the tiniest cracks. This gives your home an air-tight barrier and prevents energy loss. Of course, spray foam has more going for itself than just being eco-friendly. It’s also worth noting that it helps reduce the amount of pollen and dust that can enter the house, it offers better moisture control and it helps prevent small pests from entering your home. This type of insulation is eco-friendly on two fronts. First, it often does a better job holding in warm and cold air than traditional insulation. Secondly, it’s made from recycled newspaper. You are using a product that would have otherwise ended up in a landfill. Most of the time, community-based recycling centers provide the newspaper for this kind off insulation, which means you are helping out your community too. The biggest fear of using loose-fill cellulose, or Blown-in, is that it’s made out of newspaper, which would make you think that it’s easy to catch fire. However, loose-fill cellulose is coated with a fire resistant, non-toxic chemical before being installed in your home. Recycling products is always the most eco-friendly insulation a homeowner can use. That is why cotton insulation, sometimes called denim insulation, is a popular choice for people who want to go green. This type of insulation is usually made from fabric scraps from denim factories that would otherwise be unusable. The benefits of this type of insulation are two-fold. Cotton not only makes great insulation but also acts as a very effective sound barrier. 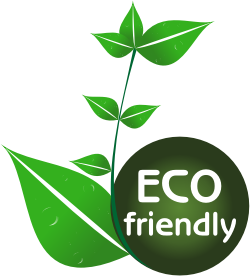 To learn more about eco-friendly insulation, contact USI online to get a free quote. USI believes that excellence in every step of the process ensures timely completion and quality service, time after time. ← What Are the Benefits of Batt Insulation?